My Appalachian Trail thru-hike provided many memorable experiences, but it was so much more than six months of beautiful scenery and physical challenges. It was more than the awesome stealth camp on Tray Mountain, the sunset at Mt. Hight, and the autumn leaves in the Bigelows; more than longhorns on Hump Mountain, wild ponies in Grayson Highlands, and goats near Angel’s Rest; more than the days of rain in Virginia, the heat wave and drought in New York, and the four-hour climb to the summit of Katahdin. It was more than the fall that resulted in two black eyes, and even more than the mixture of joy, sadness, and satisfaction I felt as I stood at Baxter Peak. These are all lasting memories, but the true highlights involved people, both hikers and trail angels; they are what made my hike the incredible experience it was. My thru-hike was the first time I’d ever known camaraderie among such a large and diverse group of people. Instead of competing, other hikers truly wished for me to finish the hike, and they were always ready to pass on information, lend a helping hand, or share their supplies. The group with whom I shared a sunset and campfire on Cheoah Bald eventually scattered, but I will always remember the closeness we felt that evening. In the Shenandoahs, instead of standing back and making fun of my awkward attempts to raise my food bag onto the bear pole with the heavy, unwieldy pole, another hiker immediately showed me the trick and helped me slip the bag into place. 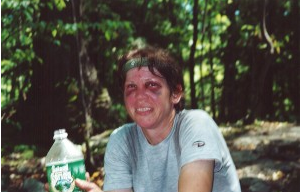 After I fell and blackened both of my eyes in New Jersey, two other hikers teamed up with me to provide emotional support as I continued northward. One of them, who I knew was a much faster hiker, stayed just a few steps behind me through the rock climbing of early New York until my confidence returned. Trail angels were kind from the very beginning, and I was moved by the extent of their caring and unselfish giving. After my fall, I had been able to hike a mile to a telephone, and I called an alumni thru-hiker that I knew of but had never met. He drove 45 minutes to pick me up and take me to the hospital for x-rays. That night and most of the next day I spent in his home as one of the family. Throughout the dry section of New York, made even worse by drought conditions and the heat wave of early August, I often came across jugs of water near road crossings. Trail angels in Maine found me waiting in the cold rain for a friend to bring my resupply box. They insisted that I come inside their RV, where they fed me lunch and allowed me to stay warm until my friend arrived. My thru-hike was the biggest and most difficult thing I’ve ever done. I challenged myself, and I succeeded. But by the time I reached the end, my focus was no longer solely on myself. Any self-importance I may have felt atop Katahdin was tempered by the knowledge that without the contributions of others along the way, I might not have been successful. Now the challenge I place before myself is to become more like the people whose selfless acts of kindness will remain in my memory as the true highlight of my AT thru-hike. Nancy Shepherd is the author of “My Own Hike: A Woman’s Journey on the Appalachian Trail.” As an accomplished thru-hiker she also maintains her own site right here. If that weren’t enough she’s also recently published “Where The Mountains Meet The Sea: Backpacking The International Appalachian Trail.” Check it our right here!